BETTER PRODUCTION MMS JUNE 2018 130 mmsonline.com SHOP MANAGEMENT used. The ideal for any shop is material f lowing in linear, assembly-line fashion from one end of the facility to the other as depicted in Figure 2 on page 126, a stark contrast to the common spaghetti diagram. 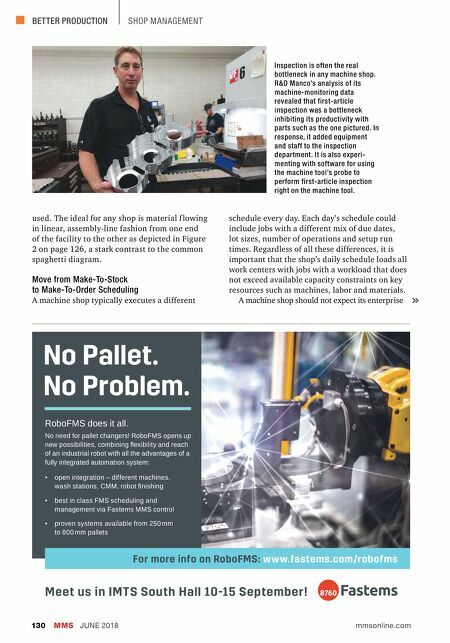 Move from Make-To-Stock to Make-To-Order Scheduling A machine shop typically executes a different schedule every day. Each day's schedule could include jobs with a different mix of due dates, lot sizes, number of operations and setup run times. Regardless of all these differences, it is important that the shop's daily schedule loads all work centers with jobs with a workload that does not exceed available capacity constraints on key resources such as machines, labor and materials. A machine shop should not expect its enterprise No Pallet. No Problem. RoboFMS does it all. No need for pallet changers! RoboFMS opens up new possibilities, combining flexibility and reach of an industrial robot with all the advantages of a fully integrated automation system: • open integration – different machines, wash stations, CMM, robot finishing • best in class FMS scheduling and management via Fastems MMS control • proven systems available from 250 mm to 800 mm pallets For more info on RoboFMS: www.fastems.com/robofms Meet us in IMT S South Hall 10-15 September! Inspection is often the real bottleneck in any machine shop. R&D Manco's analysis of its machine-monitoring data revealed that first-article inspection was a bottleneck inhibiting its productivity with parts such as the one pictured. In response, it added equipment and staff to the inspection department. 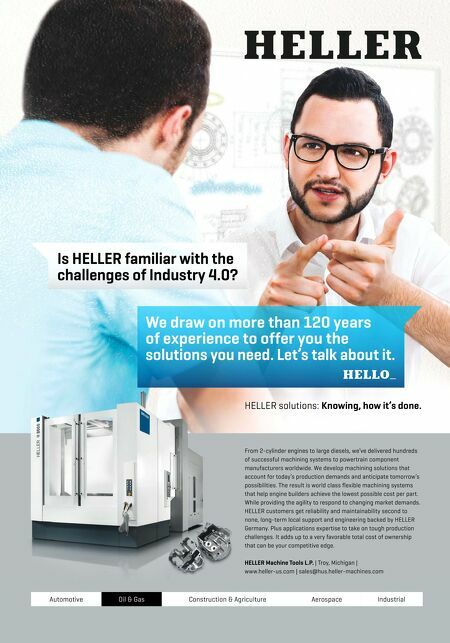 It is also experi- menting with software for using the machine tool's probe to perform first-article inspection right on the machine tool.